In my years as a games reviewer, I’ve only had to use it occasionally. I say “had to”, because it’s always been a chore. My time there has been mostly spent lost and frustrated, wondering why all of the games’ digital content pages were separated and why it was so hard to find my own games library. Its biggest issue, at least in the games section, is organization and navigation; it’s hard both to find and know what you’re looking for. This is at least in part due to its layout, which combines both mobile and console games and seems more designed to encourage browsing and impulse spending, while making it difficult to find something specific. 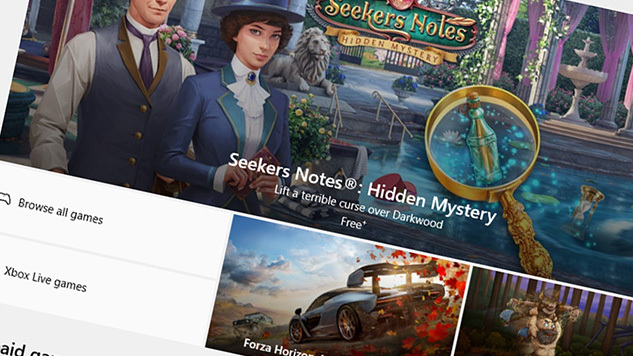 The page is divided into lists like “Top Paid Games”, “New PC Games”, “Best Selling Games” and “Top Free Games”—all metrics, of course, that the company should be paying attention to internally, but nothing that helps a person find something related to their interests. The Microsoft Store had already established a poor reputation with me years ago when I tried to purchase Dance Central DLC. I thought it’d be easier to do it there rather than tapping out my credit card number on my Xbox (where my identity was previously stolen). But I struggled to find songs to purchase, because they weren’t linked properly from the game’s store page, and when I did, there wasn’t a way to buy multiple songs at a time. The songs were, as with the other games in the store, rated with an arbitrary and seemingly pointless 5 star system which did nothing to help me sift through pages and pages of walls of thumbnails for each one. Later, when reviewing Dead Rising 4, I found the store page similarly counterintuitive in terms of layout and accessibility, and was frustrated by the lack of clarity on certain key pieces of information, like release dates for additional content and how to access them. Since Microsoft also insists on creating multiple pages for different editions of a game, instead of dedicated a single hub to multiple versions like other storefronts, it makes the difference between editions, what DLC is included, and whether or not that content is owned with the version you’ve purchased, even more convoluted. Initially, I couldn’t even find where my games are stored in the first place. Why is the My Library section hidden in obscure drop-down menu and marked with an icon that looks like it’s for the Options setting? Sometimes it seems almost impossible to even play what little you’ve purchased in the Microsoft Store. If they were friendlier to PC games, there’d be potential for Microsoft, with the enormous backing of the companies they influence and control, to take a significant portion of the digital PC sales market. And it’s tremendously unfortunate that they’re not in the position to. The complete dominance of Steam has allowed Valve to do pretty much anything they want, and it’s been a bum deal for consumers and developers alike. Lack of adequate moderating or dispute resolution, the influx of poor quality “asset flipping” indie games, and let’s not forget you don’t really own your Steam games, you merely rent them—these are only some of the issues over the years and right now Valve has little pressure or incentive to change it, because players have few other places to go. GOG has not stepped up to challenge Steam, and big publisher backed titles don’t seem to be in the long term branding strategy for Itch.io. There are no other viable options. Still, the problems go much deeper than a lack of ambition or understanding in how to accommodate the games market. Solving the Microsoft Store’s organizational problems won’t fix the other issues that need to be addressed in order for them to adequately compete. Microsoft’s Universal Windows Platform, implemented under the guise of security, is completely antithetical to how PC gaming operates and makes money today. Without being able to use mods or framerate or capture software—stuff that gets shut out by the systems’ sandbox isolation of executables—only the most casual of PC gamers will want to use the Microsoft Store. And there’s not a huge overlap between casual and PC gamers. There’s also no chance Microsoft will give up on UWP. It may be that Microsoft is so focused on creating one-size-fits-all apps (that is, apps that do not have to be recoded or reformatted for different platforms) that they don’t know how to focus in on a specific platform and isolate and play to its strengths. This would certainly explain some of the organizational issues, from how busy and random the Games page is by combining console and mobile, as well as their exhausting instance on tying all the apps and games to a single account, which only adds to the clutter. I feel like their obsession with creating cross-platform multimedia experiences is their blindspot. For example, it is convenient and easy to go into my Downloads section in the Microsoft Store and manage my Xbox One content from there. But the connectivity between my PC and Xbox One, while an entertaining novelty, is still unnerving and unnecessary. It’s as if, instead of listening to consumers and giving them what they want, they’re trying to make us want whatever they decide is the next big thing. I don’t think it’s a winning strategy. Regardless, the writing on the wall is clear. Even if Microsoft were to create a perfect storefront for the games section, there’d still be the issue of their software restrictions. But they also can’t hope to pull off their cross platform multimedia goals if they don’t fix at least one part of the equation. Maybe it’s time they tackle the one thing they’re willing to fix.